We need more than two letters to define the fabulous and multi-faceted career of Stephin Merritt. Best known as the voice and songwriting talent behind The Magnetic Fields, Merritt has just penned 101 Two-Letter Words, a collection of poems for each of the 101 two-character phrases permissible in Scrabble. The book, illustrated with cartoons by the incomparable Roz Chast, is a witty resource for language aficionados and Words with Friends addicts everywhere. Along with Wait Wait . . . Don’t Tell Me! host Peter Sagal, Merritt joins us for an evening of wordy wonders—and maybe the largest-ever Scrabble game. This entry was posted in Upcoming Concerts on October 31, 2014 by PlaylistHQ. During the set break, the screen plays music videos in high resolution of bands such as Grouplove and Neon Trees. They also throw in an ad for a Honda motorcycle, but it is in the style of a music video, so it blends in nicely. Then the screen displays “Mowgli’s” and the house lights go off. 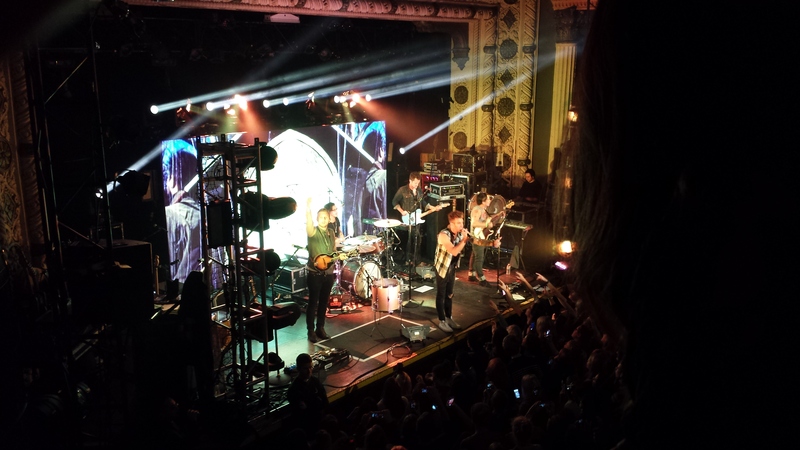 An official voice announces, “Honda Civic presents: The Mowgli’s”. All seven members of the band come out and completely fill the stage as the audience cheers. They launch into their musical style of joyous rock and roll. The lead singer tells the crowd Chicago is one of their favorite cities, and we believe them. The guitarist on the left is even wearing a Scottie Pippen jersey, Bulls #33. With one song remaining, the band asks what song the crowd wants to hear. The band plays an extended while the lead singer says “The next song we will play is called… San Francisco!” The young crowd begins to jump as they close their set with their biggest hit to date. After the stage is set for the next act, the entire Metro goes dark. We can just barely see the drummer take the stage. He bangs the drum twice and the screen blinks bright white with each slam knocking everyone back with the shock of such a bright light. This attack of light and sound continues as the rest of American Authors take the stage and begin their first song. Midway through their set, they cover Coldplay’s “Yellow”. It’s a bit of an uninspired cover, but they redeem themselves later with a great rendition of Sam Smith’s “Stay with Me”. During their entire set, they take full advantage of the screen including turning the venue into a disco during “Hit It”. To close out their set, they play “Best Day Of My Life” to everyone’s delight. We were surprised this wasn’t the final song of their encore and so we weren’t sure if they would return to the stage. However, they did return. They started their first encore song completely acoustic without microphones and amps. Halfway through the song they switched to full on sounds and the effect was quite impressive. They closed their set with “Oh, What A Life”, and we all agreed! All in all, it was a fantastic show. With this as an example of corporate sponsored touring, the future is bright! See the preview for this concert here. This entry was posted in Uncategorized on October 30, 2014 by PlaylistHQ. This solo project by André Allen Anjos is a live music experience that is very unique. The last time he was in Chicago, RAC played a majestic afternoon set at the Grove at Lollapalooza, impressing all fans from diehard followers to groupies waiting patiently for “The 1975”. His live sets are unique because he sets a beat to well-known songs, and has a band that plays live instruments to add his own melodic, catchy, and groovy touch. Combining some of his songs that are rapidly gaining popularity (“Cheap Sunglasses”) with remixes of festival favorites from “Sweet Disposition” and “I Wanna Get Better”. His ingenious variety in his sets along with his catchy beats allow for the ultimate feel-good concert experience of dancing and singing along. This is a must-see for Chicago concert fanatics. Similar to RAC, the Knocks have rapidly gained exposure through remixes. They have used remixes to draw attention to their own produced tunes. They have been named by NME magazine as one of the 20 hottest producers in music, and have shared the stage with huge artists such as Calvin Harris, Two Door Cinema Club, DeadMau5, Tiesto, and more. This concert will be nothing short of a melodic euphoria. These artists put on fantastic shows that all fans of live music can certainly appreciate. This entry was posted in Uncategorized on October 29, 2014 by PlaylistHQ. A seven-piece pop supergroup from Vancouver, The New Pornographers are veterans of indie rock and power pop. Featuring Dan Bejar of Destroyer, Kathryn Calder of Immaculate Machine, Neko Case of solo fame, John Collins of Destroyer and The Evaporators, Todd Fancey of solo fame, A. C. Newman of solo fame, and Blaine Thurier (a film producer), the band is filled with accomplished songwriters. It’s no wonder The New Pornographers still have such catchy music, after 15 years and 6 albums, without sacrificing the artistic integrity they so effortlessly crafted. With influences ranging from folk to punk, their catalog is replete with surprises. Obscure, playful lyricism and layered pop melodies tend to make the band sound much smaller than it is, which is to say that each musician is used purposefully without overwhelming the arrangement. Put simply, the band never feels crowded. A playlist is absolutely necessary to begin to understand this group, because a single song cannot capture the expansive reach of their perfectly tempered sound. A five-piece indie pop band from New York City, The Pains of Being Pure At Heart is a skilled group with a strong focus on solid songwriting and memorable hooks. Their sound hovers from indie pop to shoegaze to dream pop. Similar to The New Pornographers, The Pains of Being Pure At Heart are adept and incorporating electronic elements into their music while maintaining an organic, at times almost acoustic, sound. Whether intentionally or otherwise, they sound a bit like The New Pornographers playing Smiths covers. This entry was posted in Upcoming Concerts on October 28, 2014 by PlaylistHQ. Kidd Russell wrote a rap song about today’s holiday honoring Casimir Pulaski, the Polish freedom fighter who came to fight in the American Revolutionary War. Russell’s “Pulaski Day” is pretty much the opposite of Sufjan Steven’s “Casimir Pulaski Day” that every one else will be playing. With a flow as smooth as the pros, a shocking level of creative intelligence, maturity beyond his years and confident swag that will catch anyone’s attention, Cam Meekins is the definition ofthere’s more than meets the eye. Taking his nice and neat look for granted would be a mistake. Cam strings together lyrics that surpass his young adult peers and could challenge any of his superiors. More than just a hip hop artist, Cam is a learned musician, songwriter and visionary in control of his own destiny. Carlton is an alternative-pop trio based in Los Angeles, California. They are characterized by well crafted pop songs with an energetic live show. They released their first self-produced EP “Stretching” in October of 2013 and have stayed busy touring up and down the west coast since then. In June of 2014, Carlton released their new single “Drift” to high critical acclaim, earning them features on notable music blogs such as Good Music All Day, The Burning Ear, and Kings of A&R. Carlton is currently working on a new release and will be touring with Shwayze on the 2014 Feel Good Tour this fall. Nikko Gray is a singer-songwriter who was raised in the UK and the Netherlands but lives in the Los Angeles area now. She’s still relatively little-known U.S., but 2011 might be the year she raises her profile. She’s already off to a good start with the release of “Beautiful You Are,” an atmospheric, sensual ballad that’s just been posted on her Bandcamp site. This entry was posted in Upcoming Concerts on October 27, 2014 by PlaylistHQ. The band members are Dan Chang and Michael Garner. The Los Angeles duo weave intricate vocal harmonies and heart beat rhythms into voluminous, soaring songs that toe the line between California indie and folk rock. This entry was posted in Upcoming Concerts on October 24, 2014 by PlaylistHQ. 4 childhood friends from the San Fernando Valley in Los Angeles, augmented by 3 mid-western transplants, The Mowgli’s are a quintessential California band. Inspired by the magnetism of San Francisco, the grind of Los Angeles and the serenity of the Big Sur Coast, their songs are a joyous revival of rock n’ roll, a twisting indie-folk dance and a heartfelt protest ballad. Nowadays, “Oh, Honey” is not just something muttered under your breath at the bar. Instead it’s something worth singing out. In Brooklyn – ironically enough – honey farms seem to be on the up, especially for the residents of Williamsburg. Not just a way to make ends meet, the honey produced by these farms is worth commenting on, actually it’s worth singing about. Mitchy Collins and Danielle Bouchard decided to load up the succulent bandwagon and begin their own abundant crop venture. In searching for their niche as honey farmers, the duet discovered the mellifluous blend of their inner voices outside, wrote a few original songs, and never looked back! This entry was posted in Upcoming Concerts on October 23, 2014 by PlaylistHQ.